One tweeter writes the hashtag "#WIPowergrab" over his own drawing of two circles that don't overlap: One reads "Informative Venn Diagrams," the other "Venn Diagrams Scott Walker uses." "I will give $100 to the first journalist who asks Walker if he was too intimidated to announce this in Madison," tweets another. "$200 if you also ask him to define what a Venn diagram is." "As a math teacher I would like to thank you for creating a real-world example on how NOT to construct a Venn diagram," quips another. 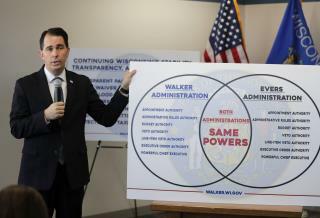 "We get that Walker is trying to downplay the changes that were made," writes Philip Bump at the Washington Post, "but, by leaving out things that separate his powers from Evers’, he ends up making the Venn diagram format particularly useless." Bump helpfully redesigns Walker's diagram by placing "More control of WEDC [Wisconsin Economic Development Corporation]," "Broader control of work requirement rules," "Broader ability to enact new rules," and "More ability to change benefits programs" in Walker's circle. Inside Evers': "Not named 'Scott.'" I see the GOP understands Venn diagrams about as well as they understand climate change. Not surprising. LOL...Walker greatly improved the State of WI and blew away the so-called intellectual democrats at every turn. Good to see they could still muster up some immature embarrassing sarcastic insults on his way out. I would hate to see them act like adults while he's still in office.